The day I graduated from Grinnell College, I felt on top of the world. I had a graduation party where most of the faculty and deans I had ever interacted with showed up to praise me to my parents, the catering department brought me a handmade corkboard from wines I had opened during my time working for them, and the president of the college showed up. Graduation weekend was filled with ceremonies highlighting my accomplishments and celebrating the connections I had forged over the previous four years. I was convinced that ending college and leaving the small town bubble of Grinnell, Iowa, could only lead to even greater things. Fast forward to 5 months later. It’s another rainy day in Chiang Mai, Thailand, and the idea of going to work fills me with a blend of dread and exhaustion. I apathetically take a last look at my lesson plan before rushing off on my motorbike to get to work. It’s just another Monday and I wonder – where did I go wrong? My first boss in Thailand was a sexist though experienced teacher of English who would always make me late for class by chatting me up at 8:59AM. My second boss, while easier to get along with, had no experience teaching, and kept telling me I was a fantastic teacher although he had never been in my classroom. I was technically a Grinnell College fellow, and was supposed to be doing service – but it became more and more apparent as time went by that my only role in the center was to be a white face (in the words of a university Vice-President), bringing in some more revenue. To top it all off, I had a total of one good friend in Chiang Mai, a fellow Grinnellian who was doing the same job as me and was just as miserable. If the end of college was a peak, then my first year out of it was the bottom of the ocean. I had set such high expectations for what my fellowship was going to be like: I expected things to only get better after college at one of my top-choice jobs. Unfortunately, my first year out of college was sometimes unbearably lonely. I missed the bubble, the critical thinkers who pushed the boundaries of liberalism, and the ability to always find a friend across the hall. 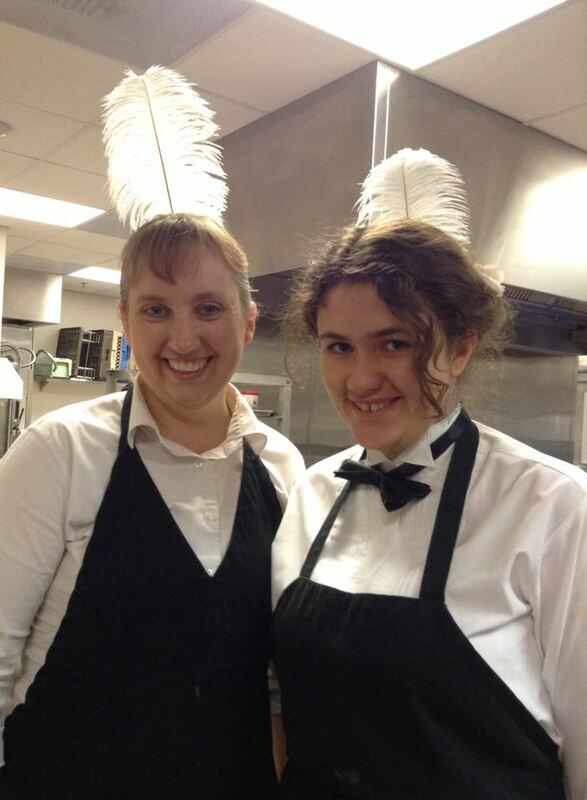 Iulia after a long catering shift. Given the professional experience I had accumulated throughout college, I didn’t expect things to go this way. I started out my first semester of college at the entry level working in the dining hall. I was stationed at the pasta bar and would take orders of veggies and sauce and saute them for my peers. I would stand for about 4 hours listening to various combinations of mushrooms, olives and green peppers, please and then go home smelling like marinara sauce. Sure, there was the occasional cute guy being friendly to the sweaty girl with the apron, but overall it was not my favorite job. Later that year, I moved on to catering, serving meals to professors, the president and the occasional Ta-Nehisi Coates-type visitor. My second year, I worked for Off-Campus Study developing some programming, but mostly sorting paperwork. Junior year, I led a team for orientation, edited a magazine, and was president of the second largest student organization on campus. And finally, my senior year, I was the Vice-President for Student Affairs in the Student Government. My college career started with getting the smell of meatballs and tomato sauce out of my hair and ended with being a guest at meals with the trustees of the college. It took me a while to realize that my Chiang Mai experience was the pasta bar of my post-graduate career, minus the grease. I had set my expectations high for life after college because life in college was everything I could have hoped for, and more. After being successful for four years and having the opportunity to grow in a safe environment, it’s hard to accept that you have to start from scratch. Since the college setting affords you so much friendship, mentorship, and institutional support, it is hard to know what to expect from the so-called real world. You don’t realize how much losing those networks will affect you until you’re left trying to salvage or recreate some sense of community and purpose. To make matters worse, your ability to speak out the way you are able to in college becomes limited. You spend years challenging philosophers and refining your worldview. You learn to demand change, and to expect it to happen. It feels disenfranchising and unfair to learn how to be a change-maker for years, only to graduate and be stifled by the fear of losing your meager salary, especially when the peers you could rely on to back you up are no longer there. 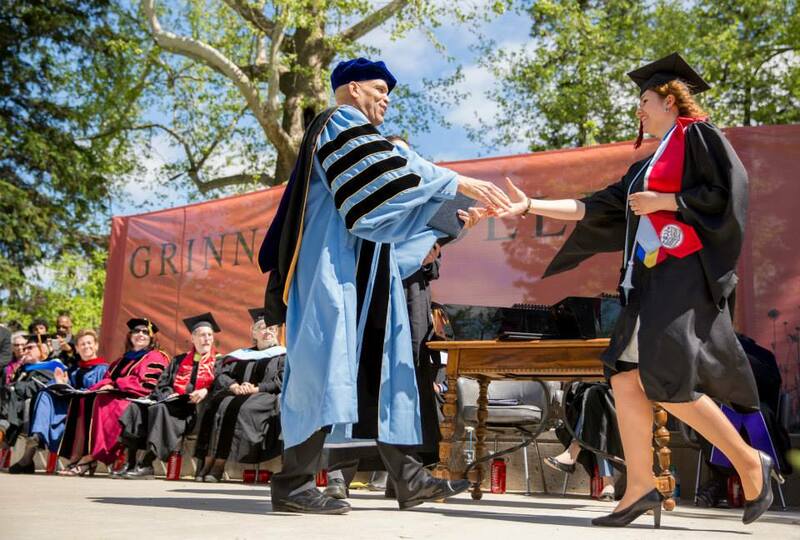 Iulia receiving her diploma at Grinnell College. Picture credit to John Brady Photography. I expected to find people to rely on in Thailand because I had never not found community. At Grinnell, I was hanging out on a roof with other first-years during my first weekend there. In Malaysia, where I spent a summer for an internship, I was immediately adopted into a group of fun, 20-year-old Fulbright teachers. Given my previous experiences, I thought that I had the cultural savvy, independence and resourcefulness to transplant myself to yet another new place. I was also convinced that being a teaching fellow was the perfect job for me because of all the Fulbright teachers I had met in Kuala Lumpur. However, I learned that the internships you’ve done do not give you the same lived experience as having a job, because they are not permanent. Once you’re done with your summer job, your friends are still on campus waiting for you to come back, but when you graduate, that feeling of security is gone. My loneliness in Thailand was amplified by the idea that I would magically find another group of similarly aged people to spend time with. My disappointment with my job came from the perception that my job would be just like the Fulbright fellowship I witnessed in KL and that it would be perfect. Instead of focusing on finding the perfect job (because I doubt it will ever be perfect), I wish I had focused on recreating community around myself. Being surrounded by supportive people when your boss is being sexist can help make those moments less difficult and help with mustering up the courage to make the transition to a new, better-fitting job. I don’t claim to know everything about how life post-graduation works. But the essential things I wish I knew before my first post-graduate year would have been: 1. Be ready for the pasta bar, because it takes time to get back at the trustee table. 2. Never underestimate the importance of building community in the dining hall.